LAKEVILLE, IN. 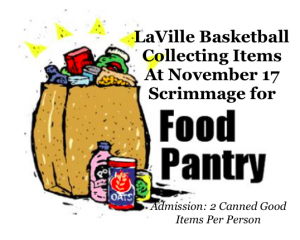 – As the LaVille Basketball team gets ready for the Saturday, November 17 scrimmage against Jimtown, the Lancers are asking for your help. Coach Michael Edison’s team will be collecting items for the local food pantry. Admission to the Saturday, November 17 scrimmage against Jimtown will be two canned food items per person. The scrimmage begins at 12 p.m. with all food items collected going to local food pantries for the coming holiday season. Please Help Lancer Basketball, Help Others!